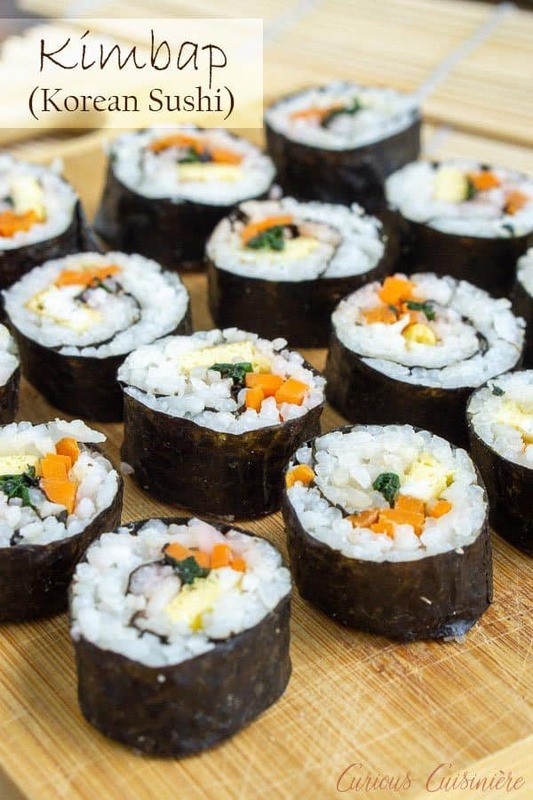 Kimbap (or gimbap) could be called Korean sushi, and if you are a fan of sushi, you are going to love the light and slightly nutty flavor of these rolls. 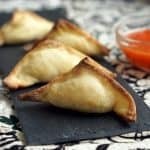 They’re the perfect recipe for summer picnics and lunches! Kimbap (pronounced keem-bahp) is often called Korean sushi, because, you have to admit, it looks a lot like sushi. Gim (or kim) means ‘dried seaweed’ in Korean and bap or bop means ‘rice.’ So, your basics of both rolls are the same: dried seaweed, rice, and fillings. Koreans were introduced to sushi in 1910, when Japan annexed Korea. 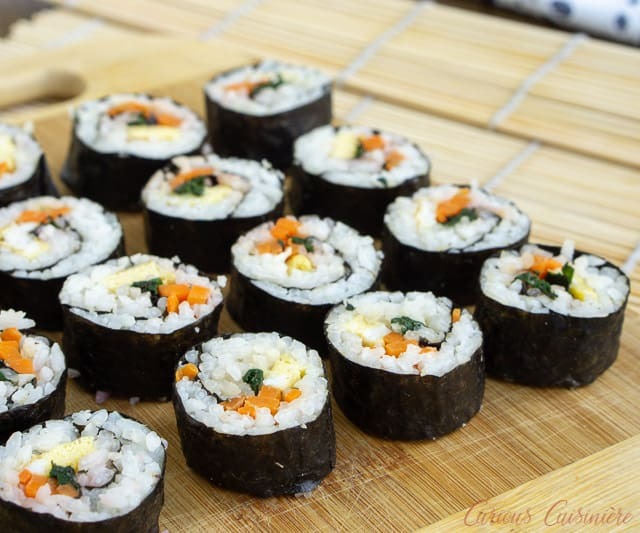 However after the end of WWII, Koreans took that sushi and made it their own: kimbap. What Is The Difference Between Kimbap And Sushi? There are three main differences between kimbap and sushi. In traditional Japanese sushi, the rice is slightly sweet and tangy, seasoned with rice vinegar. In kimbap, the rice is seasoned with sesame oil and a pinch of salt, giving it a smooth, nutty flavor. The second difference is the fillings. Japanese sushi is commonly filled with raw seafood (tuna, salmon, yellowtail). Kimbap, on the other hand, uses fresh, cooked, ingredients as its fillings. 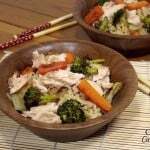 From vegetables, to eggs, even bulgogi or ham and cheese. Nearly anything goes for kimbap filling! 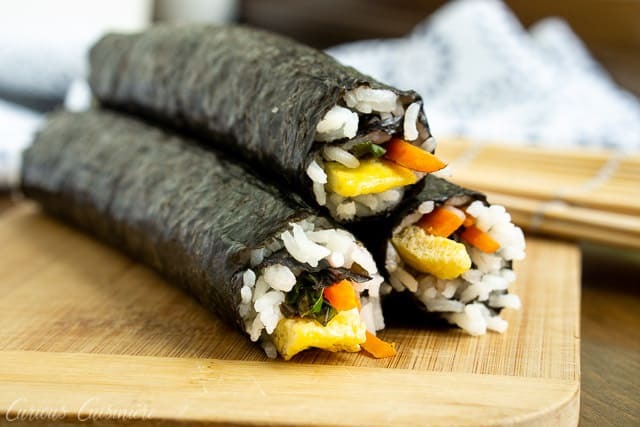 Kimbap are typically cut shorter than Japanese sushi. I don’t know about you, but as much as we love Japanese sushi, it always seems like the rolls are just a fraction too big to eat the whole roll in one bite and still have any measure of table manners. But, if you’ve ever tried to take a bit of a sushi roll, you know that route doesn’t leave you the most dignified either. Kimbap is the perfect solution to this. Since the rounds are smaller, they really are one biters. No questioning if you should bite or not. And not chipmunk-cheeked, sushi-stuffed-mouth munching. Your lunch-mates will thank you. 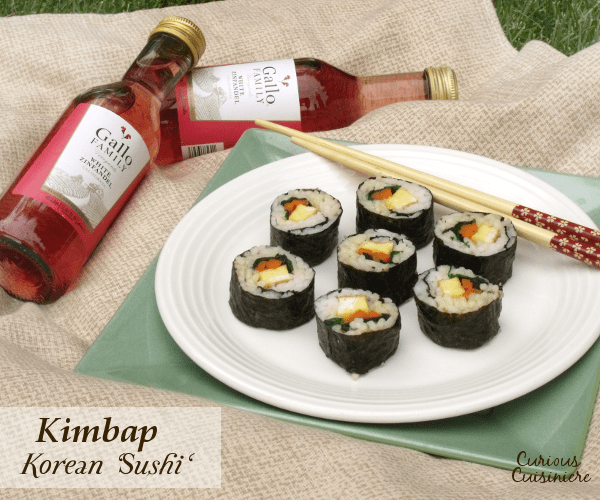 Feel free to get creative with your kimbap fillings! Today, we’re featuring one of the classic combinations: eggs, carrot, and spinach. But, these rolls are the perfect way to use up any leftovers in your refrigerator. 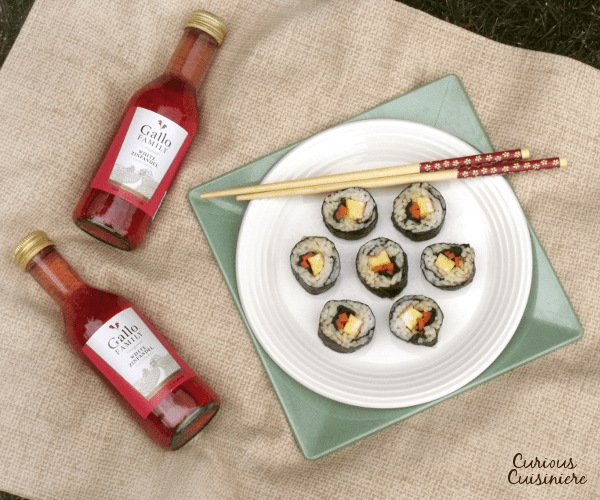 What would you put in your kimbap? 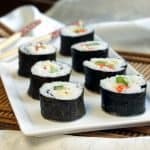 Kimbap (or gimbap) could be called Korean sushi, and if you are a fan of sushi, you are going to love the light and slightly nutty flavor of these rolls. 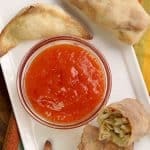 They're the perfect recipe for summer picnics and lunches! Place 1 c dry rice in a medium saucepan and add water according to the package instructions. (We typically use approximately 1 ½ c water to 1 c dry.) Cover the rice and bring it to a simmer. 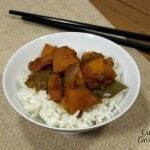 Simmer, covered until the water is absorbed and the rice is tender, 15-20 min. Remove the rice from the heat and mix in 1 tsp sesame oil and ½ tsp salt. Cover the rice and let stand for 10 minutes to finish steaming and cool. While the rice is cooking and cooling, prepare your filling ingredients. Beat the eggs with a pinch of salt. Drizzle a little sesame oil into an 8 inch (or thereabouts) skillet. Heat the oil over medium heat. Pour the beaten egg into the hot skillet and reduce the heat to low/medium-low. Cover the skillet and cook until the top of the egg is dry and puffy, 6-8 min. Transfer the omelet onto a cutting board and slice into ½ inch strips. Let cool. Add another drizzle of oil to the skillet. Add the julienned carrot and a pinch of salt. Sauté the carrots over high heat until lightly golden, 2-3 min. Transfer the carrots onto a plate and set aside. Add a bit more oil to the, now empty, pan and add the chopped spinach and another pinch of salt. Sauté over medium high heat until the spinach wilts 2-3 minutes. Remove the wilted spinach to a paper-towel lined plate to soak up any excess moisture. 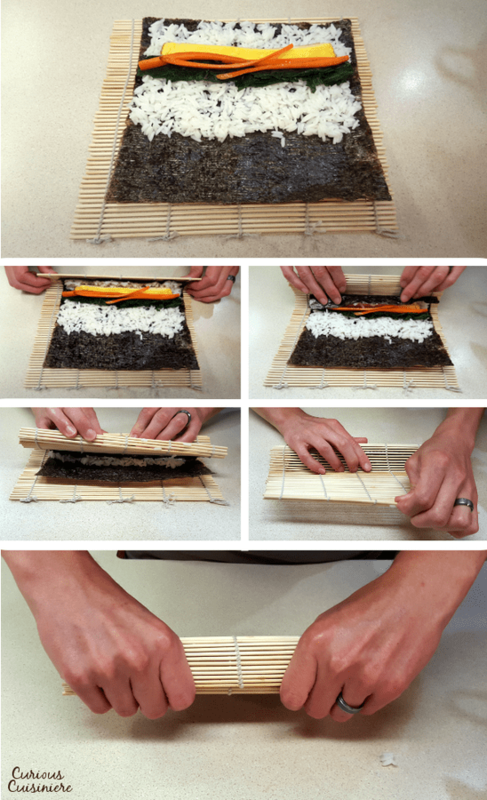 Place a sheet of seaweed on your sushi rolling mat. Spread rice over 2/3 of the seaweed, about ¼ inch thick, leaving the 1/3 of the seaweed furthest from you bare. Place the filling ingredients in a line in the middle of the rice. Start rolling the kimbap by using the mat to gently fold the section of rice closest to you over the filling ingredients. Tuck the edge of the seaweed into what will become the center of the roll as you continue rolling, pulling the mat away from you and pressing firmly. Once you have rolled up all the seaweed, keep the roll wrapped in the mat and squeeze it gently but firmly to create a solid roll. Remove the roll from the mat and place it on a cutting board. Cut the roll into ½ inch thick slices. For a picnic, pack the kimbap pieces tightly into a hard-sided, seal-able container, using wax paper between the layers if necessary. Kimbap is best eaten within 6-12 hours, but will keep well up to 24 hours, sealed in the refrigerator. How exotic! Invite me to YOUR next picnic! 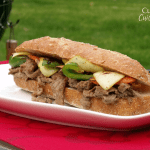 Wonderful recipe, and I am so happy to cook alongside you for the #SundaySupper picnic. How fun!!! I adore sushi so this is totally what I’ll bring to our next picnic potluck! Since I’m not a fish gal, this is my kind of sushi! It is perfect for those who aren’t fans of fish! Delicious!You’ve reminded me to use my sushi mat that’s been forgotten in some corner of my kitchen..have to make this! We forget about ours way to often. It was fun to break it out again! Have to try making these soon. I’ve never made sushi before. They’re so fun to make, and not at all as tricky as you would think! I love sesame oil. 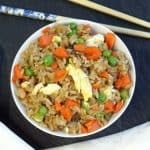 It sounds like a perfect flavor choice and a way to keep the rice moist! This was our first experience using sesame oil, and I must say, we’ve fallen in love with it! I have just become a fan of kimbap! I adore sushi, but have room for both of these in my life!!! They sound amazing, Sarah. They are so different, even though they are so similar. It’s fun to be able to enjoy them both! 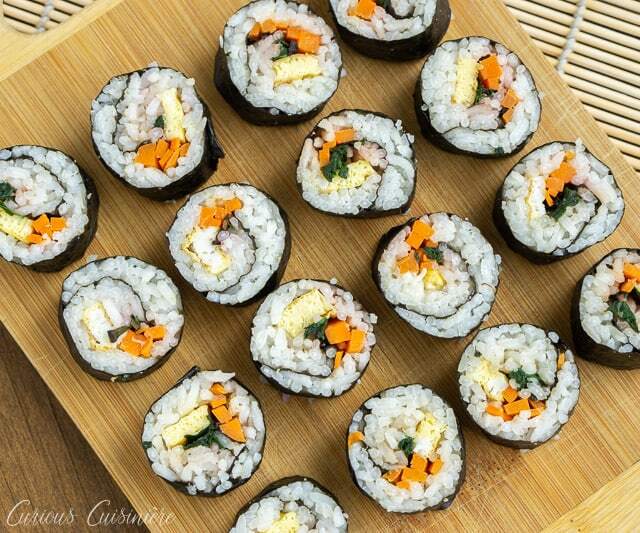 Ooh, salmon kimbap would be AMAZING!! I have never made sushi! 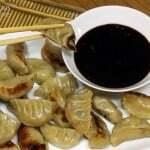 What a great recipe and thank you for the step-by step instructions. You’d enjoy making it! You should give it a try! This is a fancy picnic for sure! Great idea! Oh, my hubby ate this when he was in Korea. He’d love these! YUM! 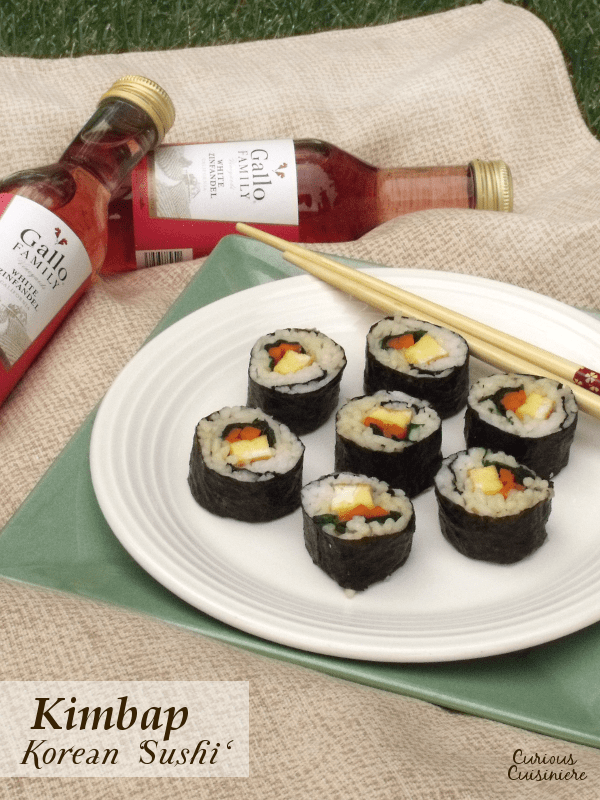 Sushi and wine for a picnic? This is a great idea! Thanks Nichole! It’s such a fun and unique addition to the American picnic basket! Adding this to my must-try sushi list. You must! The sesame oil gives it a slightly nutty flavor that totally transforms it from the normal flavors you think of for sushi!